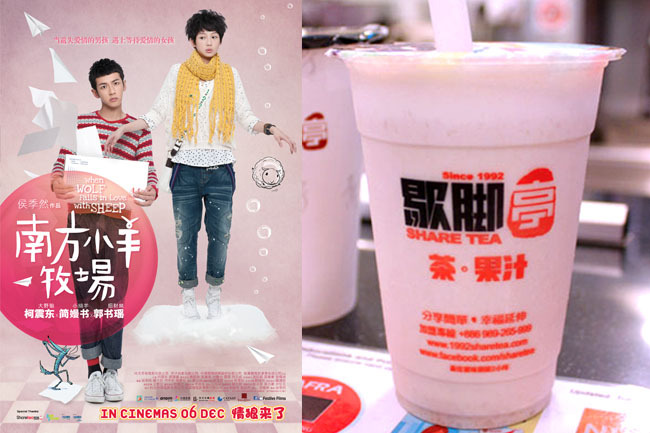 Sharetea Exclusive Giveaway – “When a Wolf Falls in Love with a Sheep” Autographed Posters + Tickets + Bubbletea Vouchers! What do Sharetea and Ko Chen-Tung have in common? They are both Taiwanese, both very popular, both rather sweet and both to be given away (in a sense). Sharetea Singapore is giving away exclusive gala tickets to “When a Wolf Falls in Love with a Sheep”, a Taiwanese romantic comedy starring the good-looking Ko Chen-tung 柯震东 (I can hear some girls screaming already) who falls in love with the quirky “Yao Yao” Kuo Shu-yao 郭书瑶. Sounds like another “You Are The Apple Of My Eye” in the making. Own and run by two young and vibrant Singaporean entrepreneurs, Sharetea has built a loyal following in Singapore and is known for its wide selection of hot and cold beverages. 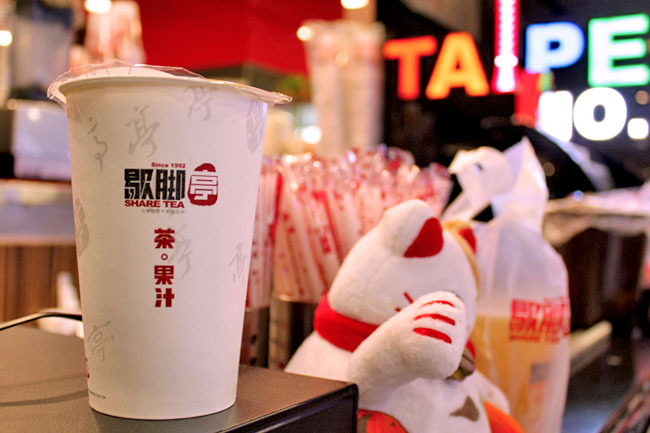 Other than the Classic Pearl Milk Tea ($2.40) and Honey Milk Tea ($2.90), other popular unique teas include the Red Bean Milk Tea ($3.50), Handmade Taro with Fresh Milk ($5.40) and QQ Happy Family Tea ($3.50) which consists of six different toppings all in one cup! [Giveaway Ended] “When a Wolf Falls in Love with a Sheep” Autographed Posters + Tickets + Bubbletea Vouchers! Want to win EXCLUSIVE Ko Chen-Tung & Kuo Shu-Yao 柯震东 & 郭书瑶 Autographed Posters and Gala Movie Tickets to “ When a Wolf Falls in Love with a Sheep” 南方小羊牧场? Sharetea Singapore is also giving away 10 additional sets of $20 vouchers to 10 lucky Daniel’s Food Diary readers. Results will be announced Fri 30 Nov 2012. Contest winners must be addressees of Singapore to facilitate postage. classic milk tea with pearl will never go wrong! Handmade Taro Fresh Milk is my all-time favourite!!! Kiwi with Ice Jelly Fruit Tea! I <3 the honey milk tea since it tasted really Taiwanese milk tea and also the aloha fruit tea, it really give a fresh taste and refreshing! I LOVE RED TEA. SIMPLE YET REFRESHING! all time favourite: pudding milk tea!!!!! I love their Taro Fresh Milk the most! All time fav is Taro Milk Tea with white pearls. so gooood! Handmade Taro with Fresh Milk! Congrats! You have won $20 vouchers from ShareTea. Please send an email to DanielFoodDiary@gmail.com with your contact details and address. Enjoy your bubbletea pleasures and Merry Christmas in advance! Handmade Taro with Fresh Milk. My favourite has to be Pudding Milk Tea!!! I <3 Sharetea's Pudding Milk tea, it's something special! Handmade Taro with Fresh Milk! AWESOME DRINK <3 <3 <3. I love your mango fruit tea 😀 Yay ;D.
Handmade Taro with Fresh Milk ! It is healthy because it is taro and also the combination of taro with fresh milk is really awesome, i always want more you know. My favourite Sharetea drink is Passion Fruit Tea. Thank you for this Giveaway. Pudding Milk Tea for me! the new winter melon milktea <3! Taro Milk Tea with white pearls! 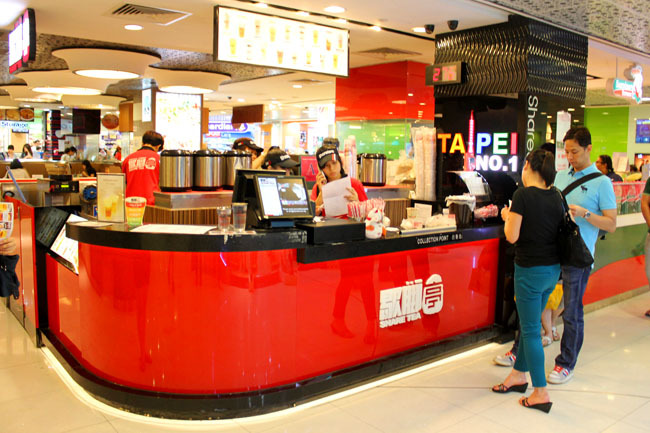 I have Liked Sharetea Singapore & Daniel’s Food Diary and I have Share the Blog Post. Hopefully I can win the “When a Wolf Falls in Love with a Sheep” Autographed Posters + Tickets + Bubbletea Vouchers. Thanks. I love Sharetea’s Pearl Milk Tea. Handmade Taro with Fresh Milk! <3 liked and shared fb pages and posts!!! Have done all the required steps, i definitely hope for the best results to enjoy the tasty bubble tea and the movie!!! I <3 SHARE TEA! Especially Lychee Milk tea! ♥♥♥♥ Pudding Milk Tea ♥♥♥♥. I love Taro Fresh Milk! You like bubble tea go to bugis. There is a taiwan tea shop near cold storage. The coffee jelly milk tea is very good. Pudding milk tea! All time favorite ^^. ShareTea’s Milk Tea with chewy & QQ pearls! Congrats to Leena Soh, Kai Wen, Ck Chai, Kimberly Chang Jae Jin, Tse Lyn, Jacqualine, Diana Chiu, Sihui Low, Benjamin Peng, and Brenda Ng. You have each won $20 vouchers from ShareTea Singapore. Enjoy your bubbletea pleasures and Merry Christmas in advance! Don’t worry if you didn’t win, look out for more yummy giveaways at Daniel’s Food Diary next week!